While they were able to salvage the series finale down in Clemson, South Carolina, the #8 Louisville Cardinals (24-8, 10-5) dropped the series against the #13 Clemson Tigers (24-8, 11-4) two games to one, as the Tigers took advantage of Louisville’s high caliber pitching staff. 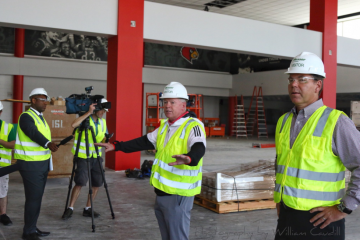 All weekend long the Cards played in an extremely hostile road environment, which didn’t help the fact that to this point in the season, Clemson was Louisville’s highest ranked road opponent. 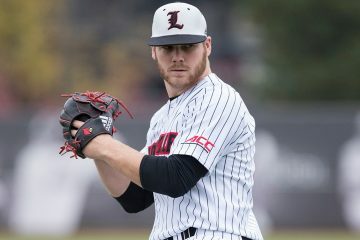 In the first two games of the series, Louisville allowed 11 earned runs in 16.0 innings pitched (6.19 ERA) even though Reid Detmers has yet another double digit strikeout day. Simultaneously, the hitters posted only 4 runs on 8 hits over both games. While they batted over .300 with runners in scoring position and with 2 outs in these two games combined, the fact that Louisville could not string together hits contributed to their offensive woes. Fortunately, the Cards avoided getting swept in a three game series for the first time since 2011 (Seton Hall) by taking game 3. Their 7 runs on 14 hits was double what the offense had seen in the previous two games against the Tigers, and some late inning heroics helped claim the series finale. After not having given up a home run all season, the Clemson Tigers took starting pitcher Reid Detmers yard 3 times, defeating the visiting Cards by a score of 5-1. 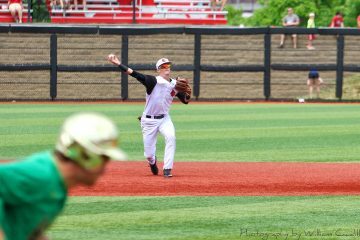 On top of the Detmers giving up more runs than he usually would, the Louisville offense could not seem to get going either as they totaled just 4 hits and 2 walks, with 3 players registering 2 or more strikeouts. Swinging a hot bat as of late, second/third baseman Justin Lavey continued on his hot streak as he was the first to put runs up on the scoreboard in the game. Registering only his second double of the season, he did so with freshman Alex Binelas on first to bring him home and give the Cards an early 1-0 advantage. Heading into this game, he had been batting .360 with a home run and 3 RBIs in his last 7 games. Heading into today with only one bad outing in his 7 starts on the season, it was only a matter of time before sophomore Reid Detmers was brought back down to Earth if only for a moment. Clemson greeted the Perfect Game/D1Baseball midseason Pitcher of the Year with a heavy dose of the long ball, as the Tigers plated all 5 of their runs in the game exclusively off of home runs. The third inning is where Clemson did most of their damage, with Logan Davidson launching a 3-run homer with Kyle Wilkie hitting a solo shot on the very next at bat. Elijah Henderson, the eighth man in the lineup for Clemson, also got in on the action by nabbing a solo shot of his own in the fifth to make it 5-0. The offense for the Cardinal Nine only went downhill after Lavey’s RBI double. 2 of Louisville’s 4 hits in the game came in the first two innings of the contest, with the Cardinal Nine attaining 4 or less base runners in 6 of their 7 final innings at bat. 3 of their hits came from the leadoff spot in the inning, but they were unable to capitalize on almost all of them, batting just 1-5 with runners on base. Freshman Jack Perkins gave his best late game effort, tossing a pair of scoreless innings and 3 strikeouts once Reid exited the game to regain a little bit of momentum from the mound. However the anemic offensive proved to be too much to attempt to start a rally, and the Cards fell short on Friday for just the second time of the season. A late inning rally in the final two innings of play was not enough to overcome a lack of significant offensive production throughout the majority of the game, as the Cardinal Nine fell 6-3 in front of a raucous Clemson crowd to lose only their 3rd three game series of the season. Pitching was not as hot as it normally is for the Cards, as they failed to resister double digit strikeouts for only the 13th time this season. Much like Reid Detmers the night before, Clemson’s red-hot bats had no trouble against starting pitcher Nick Bennett. In his 5.0 innings on the mound, the junior lefty struck out only 5 batters and gave up 5 earned runs on 7 hits, including a leadoff home run in the fourth and a 3-spot in the fifth. This marked the second time in a row that he surrendered 5 runs, as well as the fifth time this season that we was limited to just a 5.0 inning start. Clemson’s Grayson Byrd did the majority of the damage against Bennett, going 2-3 against him with 3 RBI including the leadoff homer in the fourth. 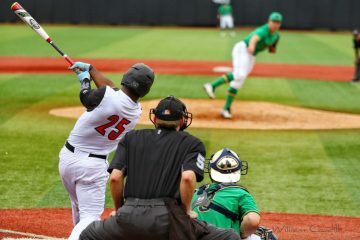 Further compounding the losing effort was Louisville’s lackluster performance at the plate. The Cardinal Nine went 3 up/3down in their first five innings at bat, and only collected two hits over the first seven innings. However, once Bryan Hoeing entered the game for Nick Bennett, he would help stop some of the bleeding and regain a little bit of momentum from the mound. The senior right-hander was able to strikeout 4 batters in 3.0 innings of relief and only surrendered a single run in the 8th inning. Once the game entered the late innings, Louisville’s bats finally decided to wake up. The Cards finally were able to crack the scoreboard in the eighth inning, thanks to outfielder Drew Campbell. 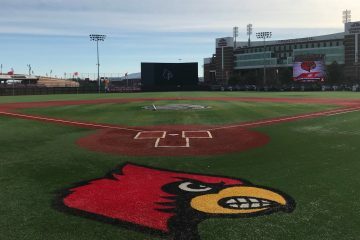 Following a leadoff single from freshman Alex Binelas and a double from sophomore Lucas Dunn (his first base hit since coming back from injury), the junior outfielder delivered on a single to right field to finally get Louisville’s goose egg off the scoreboard and his 16th RBI of the season (4th on team). With only the ninth inning left and facing a 5 run deficit, Louisville’s odds were pretty bleak. But that didn’t stop them from at least trying in front of a crowd who had just left the Clemson Football spring game. With two men on, junior first baseman Logan Wyatt collected his 5th base hit in as many games to pull the Cards within 4. A sacrifice fly from Zach Britton to bring home Trey Leonard would make it a 6-3 game, but the out would prove costly as a Lucas Dunn groundout in the next at-bat would end the game and clinch the series loss. Facing an 0-2 series deficit for the second time in three weeks, the Cardinals once again avoided getting swept as a quick start and a 3-spot in extra innings was enough to put the Cardinals on top by a score of 7-4. The 1-3 hitters in the lineup all registered 3 hit days, with junior shortstop Tyler Fitzgerald leading the team in RBIs with 2. Making his first start since the Boston College series because of injury, Lucas Dunn swiftly made his impact on the series finale. The sophomore was the first to crack the scoreboard with an RBI single after junior Justin Lavey had reached third via the walk, stolen base then balk. In the third, sophomore Zach Britton registered his second sacrifice fly of the season after junior Tyler Fitzgerald stole both second and third base to get in scoring position. True freshman Henry Davis rounded out the early inning scoring for the Cards with his third home run of the season to make it 3-0 after three innings of work. Unfortunately, Clemson was also quick to put up as many runs as Louisville The Tigers knotted up with the Cardinals using just the third inning alone with a 3-spot off of starting pitcher Bobby Miller. After surrendering a two-out run in the fourth inning to hand Clemson the lead, the 2018 freshman All-American would see the end of his day. Between Miller’s exit and the end of the fifth inning, freshman Jared Poland and junior Adam Elliott would combine for 1.1 scoreless innings and allow for only 1 hit. Louisville’s best pitching performance of the day would belong to junior Michael McAvene. The fire-balling right-hander would toss 3.0 scoreless inning and strikeout a season high 6 batters while allowing no walks. While McAvene was busy fooling Clemson hitters, the Cards were able to tie up the game thanks to a sacrifice fly from Tyler Fitzgerald (leads team with 4) to send home Lucas Dunn. The game was extended into extra innings for the 4th time this season for the Cards, and Louisville made the most of them. The bats exploded in the 11th inning, which saw 2 home runs in 3 at-bats from freshman Alex Binelas and junior Drew Campbell. Binelas’ long ball was his 4th of the season which leads the team, and Campbell’s was his first of the season. Tyler Fitzgerald would also get in on the scoring off an RBI single for his 27th RBI of the season to conclude Louisville’s extra inning scoring efforts.